Dumbarton Oaks’ mission to foster original research and publication in humanistic studies has found a parallel expression in the Friends of Music commissions and performances of contemporary music. Review of Samuel Barber's premier of Three Songs from Rilke at Dumbarton Oaks, Washington Post, April 9, 1950. The Blisses were lifelong patrons of composers and musicians, and they transferred this passion to the institution that they created. Most famously, they commissioned Igor Stravinsky to compose the Dumbarton Oaks Concerto to celebrate their thirtieth wedding anniversary in 1938. On the occasion of their fiftieth anniversary in 1958, Dumbarton Oaks followed in this tradition with its commission of Aaron Copland’s Nonet for Solo Strings (first performed in 1961). However, long before this date, Dumbarton Oaks, through its Friends of Music concerts, had accepted the mission of engaging composers and artists of promise as well as of offering and commissioning contemporary musical compositions. Until their deaths, the Blisses helped guide this aspect of the Friends of Music programming. I am most anxious, as I know you are, to have the Dumbarton Oaks Concerto played again, and if possible, conducted by Stravinsky. What would you think of having an all Stravinsky program in the spring? Do you think that Stravinsky would be willing to write a composition for violin and harpsichord, if commissioned to do so, and if so have you any idea what his fee would be? If this idea appeals to you and if you see him, could you ask him when he would be in this part of the country, and also if he would consider writing such a composition? The musical program for the year sounds as if it would be a great treat, and I shall be more than ordinarily eager to hear more of it when your arrangements become more detailed. There is one item, however, with which I am not quite in agreement, and that is to commission Stravinsky to write something for Dumbarton Oaks again. In the first place, we have the Dumbarton Oaks Concerto which happens to be, fortunately, an exceedingly interesting composition. Secondly, he is a very expensive luxury. Thirdly, to have two compositions by Stravinsky and none by anyone else would seem to me a bit lopsided. Fourth, wouldn't it be of more interest, not only in the present, but, also, in the long run program for Dumbarton Oaks, to commission other composers now and then—Shostokovitch, Pistou, Hindemith, Jean Francaix, etc.? In this way, there might be built up over the years a distinguished Dumbarton Oaks musical library. Of course, none but the most outstanding composers should be considered and there are periods which might yield superb results and other periods which would have little to offer us musically. So, dear Jack, unless I hear from you to go ahead anyway with Stravinsky, I shall do nothing about it. P.S. I forgot to say above that, of course, I think we should definitely try to have Stravinsky conduct his Dumbarton Oaks Concerto and I will take that up with him before we leave. Stravinsky would, in fact, conduct the Dumbarton Oaks Concerto in the Music Room on April 25, 1947. The Friends of Music concert on February 7, 1947, which was only the third concert after the inauguration of the series at Dumbarton Oaks, presented a program of new music by young American composers under the direction of William Strickland. The purpose of the program was to acquaint the audience with recent compositions by America’s rising musical talents. Although the review in the Washington Post on February 10, 1947, was mixed—“Chamber Symphony by Homer Keller created a flurry of apprehension”—both Dumbarton Oaks Director John Thacher and Strickland were pleased with the results. 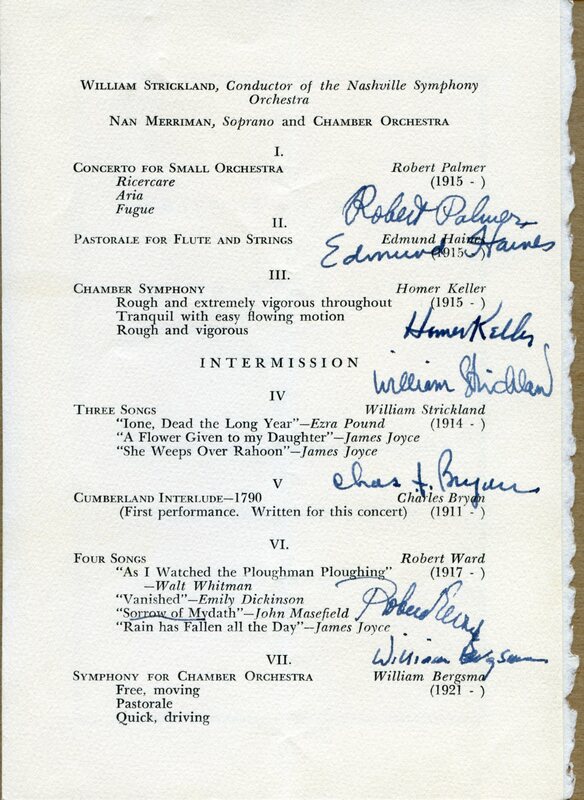 All of the composers were in attendance, and they signed a copy of the program for the Archives. The Friends of Music at Dumbarton Oaks also took Mildred Bliss’s directive to commission new music to heart. Over the years, the Friends of Music commissioned several compositions, notably Samuel Barber’s Melodies passagères (Rilke), performed in 1952 with Francis Poulenc at the piano. Other commissions included Charles Bryan’s Cumberland Interlude–1790 (1947, with Nan Merriman), Paul Des Marais’s Pastorale (1948), Stanley Hollingsworth’s Dumbarton Oaks Mass (1953) and I saltimbanchi (1960), Paul Ramsier’s Night Songs (1960), Gian Carlo Menotti’s Canti della lontananza (1969, with Elly Ameling), and Charles Turner’s Serenade for Icarus (1960). Several composers wrote works for Dumbarton Oaks, where they were then first performed. These included Barber’s Three Songs from Rilke (1950, with Eileen Farrell and the composer accompanying), Robert Ward’s Third Symphony for chamber orchestra (1950), and Stravinsky’s Septet (1953, dedicated to Dumbarton Oaks). In 2007, in anticipation of the Blisses’ hundredth wedding anniversary and to celebrate the completion of the Robert Venturi–designed library, the renovation of the Main House, and the reopening of the Dumbarton Oaks Museum in 2008, the institution commissioned from Joan Tower the Dumbarton Quintet, which received its Washington premier in the Music Room with Tower at the piano. And this year, in celebration of Dumbarton Oaks's seventy-fifth anniversary, Dumbarton Oaks commissioned from Caroline Shaw a string quartet, Plan & Elevation (The Grounds of Dumbarton Oaks), which was premiered by the Dover Quartet in the Dumbarton Oaks Music Room on November 1, the historic anniversary date.